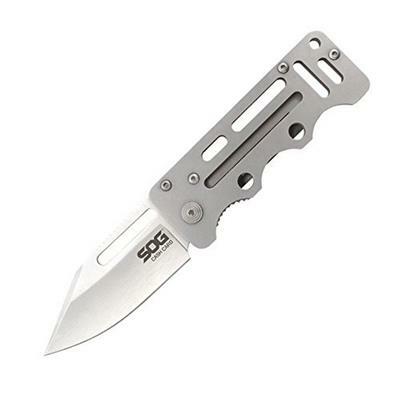 The SOG Specialty Knives & Tools EZ1-CP Cash Card is a compact styled folding knife that is lightweight, compact, and quick to open. Utilizing a locking mechanism using a leaf spring wedged in the tang of the blade to lock in the open position. Made of 8Cr13MoV steel with an attractive satin finish, the 2.75-inch single sharpened edge on the blade provides clean cuts and easy serviceability. The stainless steel handle does not readily corrode, rust or stain with water as ordinary steel does. This knife is well balanced and strong with a weight of 2.0-ounces. The SOG Specialty Knives & Tools EZ1-CP Cash Card comes with a limited lifetime warranty that protects against defects in manufacturing and materials. Each SOG product is created with the help of company founder and chief engineer, Spencer Frazer. Known for their uncompromising style and performance, these knives and tools showcase innovation, dependability and a unique, futuristic style that has garnered awards and recognition worldwide. SOG products have also won favor among law enforcement, military and industrial customers that rely on their tools to perform flawlessly in the toughest, most adverse conditions.